Highlights – - Increases functioning of the pancreases, liver, and spleen - Enhances absorption of food in the body - Effectively controls body weight and sugar levels - Useful in diabetes related complications - Helps with eyes, blood, digestive, and kapha related problems Description – Karela (bitter gourd) is a well-known Ayurvedic herb. 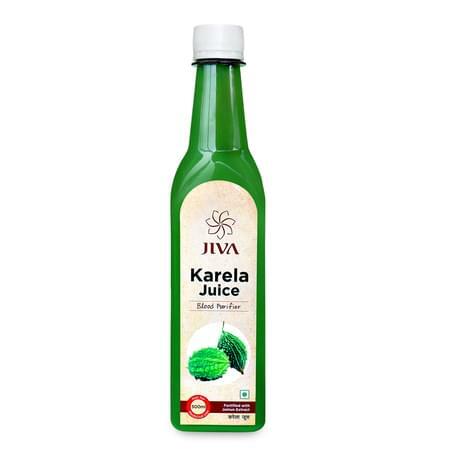 The juice is extracted from the fruits and leaves of karela, one of the rare plants that contain Polypeptide-P, a plant insulin that lowers blood sugar level. When enriched with the goodness of jamun seed extract, it can be a versatile tonic for diabetes, blood disorders, piles, and intestinal worms. It is also effective in losing weight, improving liver functions, and cleansing toxins from the body.